Sridevi did her own costumes for the film Heer Ranjha and was inspired from paintings from the bygone era. Sridevi has mostly stuck to a team of favourites; Saroj Khan as choreographer, Neeta Lulla and Manish Malhotra as designers, Rakesh Shreshta and Gautam Rajadhyksha her favourite photographers, Mickey Contractor, makeup artist. Sridevi was the second choice for her three acclaimed films: Nagina was Jaya Prada's rejection, Chandni was to be made with Rekha and Sadma with Dimple Kapadia. Sridevi's daughter Jhanvi's favourite actor is Hrithik Roshan, and actress Preity Zinta. Priety Zinta's favourite actress is Sridevi. See clip here. Sridevi has worked with all the top stars of the 1970s (Rajesh Khanna, Vinod Khanna, Amitabh Bachchan, Shatruhan Singha), '80s (Rishi Kapoor, Jeetendra, Sunny Deol, Sanjay Dutt, Anil Kapoor) and even '90s (Shahrukh Khan, Akshay Kumar and Salman Khan). Sridevi is a big fan of Shammi Kapoor and the dancing of Michael Jackson. Sridevi's favourite American actresses are Meryl Streep and Julia Roberts. When MTV first launched in Mumbai, a VJ called Sri, "The Julia Roberts of Bollywood!" on the set of Roop Ki Rani Choron Ka Raja. Amitabh Bachchan presented the Best Actress award to Sridevi for the film Chaalbaaz. Nearly a decade later, Sridevi presented him the Best Actor award for the film Black. 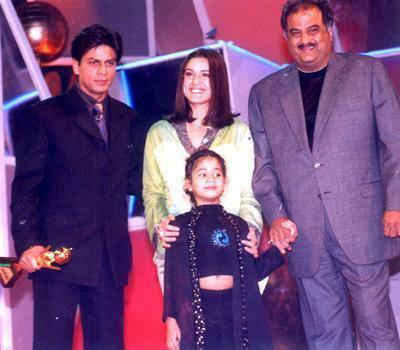 Sridevi's comeback film Shakti was put on hold when she realised she was pregnant with her second child and asked her favourite actress Kajol to step in. Kajol initially agreed but because of long outdoor shoots and with a newborn baby who couldn't travel, she backed out. Karishma Kapoor stepped in afterwards. The film was a flop but its Aishwarya Rai-Shahrukh Khan item number Ishq Kamina was a super-hit. Sridevi worked with Hrithik Roshan in his first film; Hrithik was a child artist in Bhagwan Daada (dad Rakesh Roshan and Rajnikant starred). Sridevi refuses to name her favourite co-star but did acknowledge that Amitabh Bachchan was "the greatest". 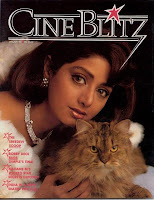 Sridevi is petrified of cats. 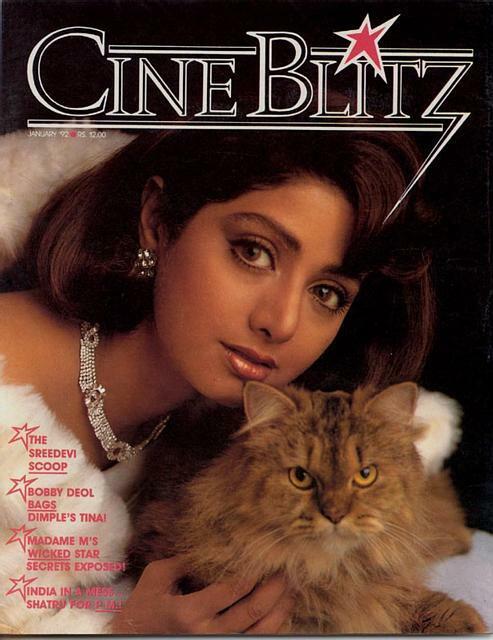 She had to pose for the cover of Cine Blitz with one. Asha Bhosle and Kavita Krishnamurthy sang most of Sridevi's songs. Lata Mangeshkar sang all of Sri's most popular songs. Sridevi herself sang in the superhit, albeit shrill, title song of Chandni with singer Jolly Mukherjee. Though producer/director Yash Chopra worked with all the top actresses of India, in MOVIE magazine (1993 issue), he reportedly said, "Juhi and Madhuri are good. Sridevi's the best". Sridevi never shied away from acting with younger co-stars including Deepak Malhotra (Lamhe), Arwind Swami (Deva Raagam) and Akshay Kumar (Meri Biwi Ka Jawab Nahin). 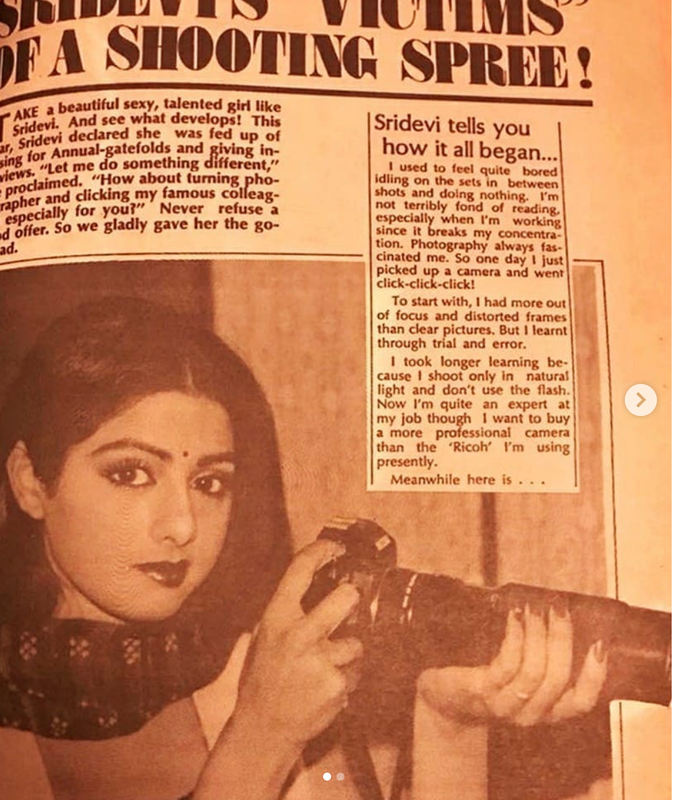 For photoshoots for Mumbai magazines, Sridevi even posed with Sunil Shetty, Saif Ali Khan and Aamir Khan - though none of these actors shared screen-space with Sridevi on film. Although Sridevi did many films with Jeetendra (9), Anil Kapoor (9) and Rishi Kapoor (8), it's Kamal Haasan that she did the maximum number of films with. Kamal Haasan and Sridevi were considered to be one of the best on-screen pairs in the number of Malayalam, Telegu and Tamil films they did together. Both were considered versatile actors as well as incredible dancers. Together they did a record 13 films together in Tamil, including; 16 Vayathinile, Vazhvemayam, Meendum Kokila, Moondram Pirai and Sigappu Rojakkal. People were so enamored by the two, they wondered how they did not fall in love with each other beyond the sets. Years after they appeared on film, Kamal Haasan said in a TV interview that the duo fought often throughout the making of the films and he was a "bully". Whether spoken in jest or seriously, the two superstars were (and remain!) friends. After Sadma was released (and flopped, despite its acclaim) in 1983, the two didn't appear in films together until 1985 when the did their last film together; Oka Radha Iddaru Krishnulu. Most memorable for its Ilyaraja songs, the two actors should reunite on screen. 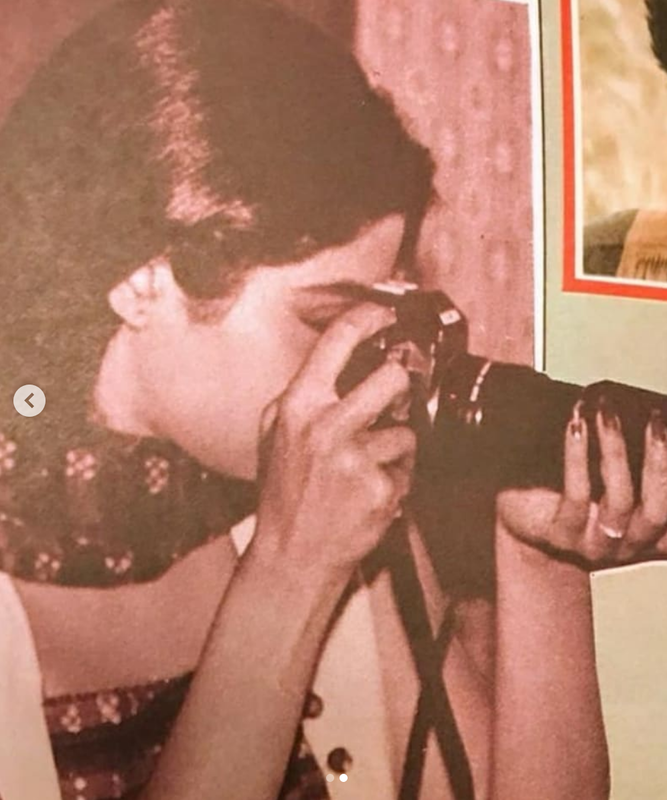 Sridevi's an avid painter and only the privileged few have her artistic endeavors hanging on their walls, namely Salman Khan and Manish Malhotra. 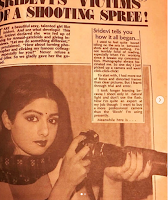 Sridevi spells and signs her name as 'Sreedevi', not Sridevi, Shree Devi, Sri Devi etc. Somehow, when credits are written in Hindi films, the name ended up as Sridevi. Well, if the lady herself didn't protest, why should we?! When Sridevi first joined the Hindi film industry, she spoke no Hindi so her voice was constantly dubbed by other artists, most notably by yester-year actress Naaz, and Habiba. In 1986, superstar Rekha dubbed for Sridevi in Aakhri Raasta. Rekha and Sridevi were great friends in the 80s. After Chandni, Sridevi started dubbing her own films in Hindi. My most unforgettable moment - Film fare for "Chaalbaaz"
I used to feel quite bored idling not he sets on in between shots and doing nothing. I’m not terribly fond of reading, especially when I'm working since it breaks my concentration. Photography always fascinated me. So one day I just picked up a camera and went click-click-click! To start with, I had more out of focus and distorted frames than clear pictures. But I learnt through trial and error. It may seem like an exaggeration but the nation can be divided between Sridevi and Madhuri Dixit fans; each loyal to the respective superstars. Sridevi's own famous fan club however includes: Saif Ali Khan, Kareena Kapoor, Kajol, Aamir Khan, Ajay Devgan, Manisha Koirala, Shilpa Shetty, Juhi Chawla, Anil Kapoor, Salman Khan, Akshay Kumar, Urmila, Raveena Tandon, Amrita Arora, Vikas Bhalla, Amrita Singh, Anupam Kher, Asin, Celina Jaitley, Karishma Kapoor, Deepa Sahi, Diya Mirza, Emraan Hashmi, Ganesh (choreographer), Gracy Singh, Isha Koppiakar, Mahima Chowdhary, Lara Dutta, Manish Malhotra, Karan Johar, Neeta Lulla, Nana Patekar, Padma Lakshmi, Nagarjuna, Priety Zinta, Madhoo (from the film Roja), Ram Gopal Verma, Rakhi Sawant, Sangeeta Ghosh, Shatrughan Sinha, Shekhar Kapoor, Harmesh Malhotra (who at one time ONLY worked with Sridevi), Sonu Sood, Tanisha, Yash Chopra, Zayed Khan. Also see this fab page on what others say about Sridevi! Sridevi and Jaya Prada shared a notoriously acerbic relationship. Both hailed from the same region, appeared in Bollywood at roughly the same time. In the initial years, their status quo was iffy. Jaya Prada famously said about Sridevi, "Making faces is not acting." Er. Right. And as Sridevi climbed up the ladder of success, Sri also famously said about arch-rival, and former friend, Rekha, "When Rekha is ill, there's no one to give her a pill." Years on, with age and maturity, all three actresses remain cordial at best, un-controversial at worst. Sridevi reveals her minimum essential make-up kit: La Prairie Platinum cream, some eyeliner and a lip gloss.. She says she believe in minimal make-up.. All those gorgeous ladies, go and grab the La Prairie Platinum cream. What did she mean when she said "When Rekha is ill, there's no one to give her a pill."? It may b refers to that Rekha does not have any one nearby who can take care of her in need. That's what I understood. U can also think of rekhas status quo. Read in between the line.